Jogja: The Soul of Java | What an Amazing World! A few days ago I went to Jogjakarta (officially Yogyakarta) to attend a friend’s wedding. Being in Jogja (Jogjakarta’s nickname) is like being in the center of Javanese culture. The province of The Special Region of Yogyakarta is actually the only province in Indonesia which has a Sultan as the governor. Everything in the city brings up the atmosphere of Javanese culture to its essence, from the omnipresent Javanese traditional writings to traditional means of transportation (becak and andong) which flock the streets. 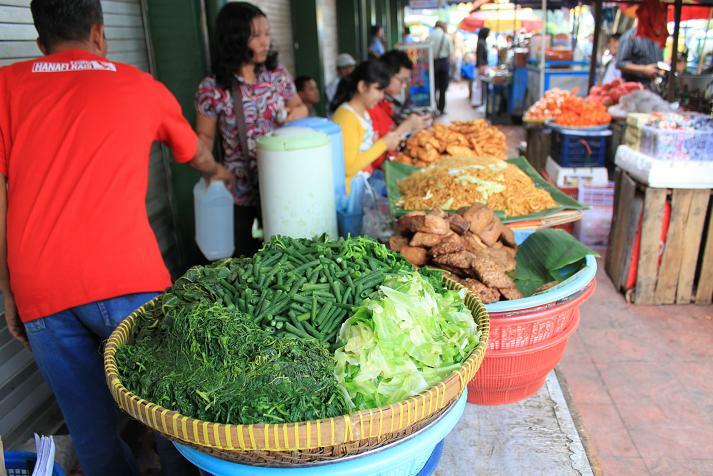 The famous Javanese hospitality can also be felt through the people (Jogjakartans), who are very warm and polite to everyone. Speaking about Javanese hospitality, I do recommend Puri Chorus Hotel as the place to stay during your visit to Jogja. It also offers great room with cheap price (I canceled my hostel booking since I found out that Puri Chorus offers cheaper price but with better accomodation). 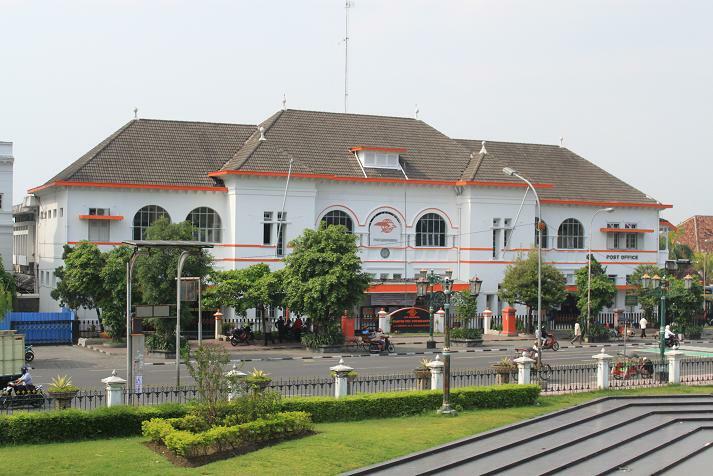 To reach the hotel from the airport you can take Trans Jogja bus number 1A and get off at LPP shelter. Then take 10 minutes walk to reach the hotel from the shelter. A friend of mine (fellow photography enthusiast I must say) came with me along the way around Jogja. You can read his story in his blog. 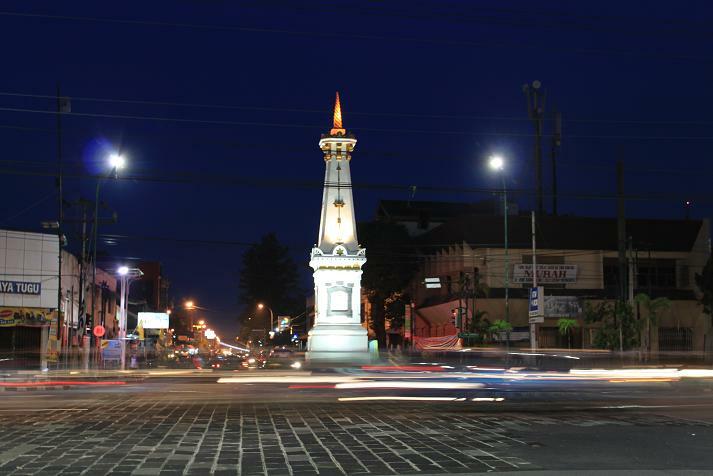 Experiencing the city can be done in a roughly 2 km walk, starting from Tugu monument to Keraton (Sultan’s palace). Just a little fact here: Javanese are notorious for its strong belief in mysticism in daily life. 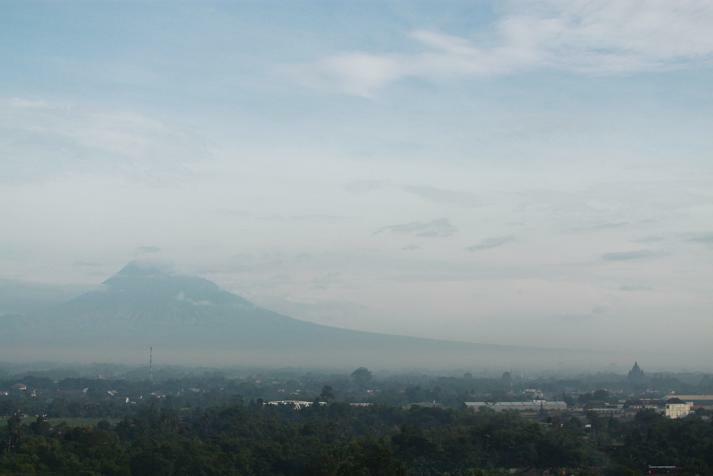 That is why the Keraton and Tugu are in straight line with Mount Merapi to the north and the south sea (which according to some beliefs that it is guarded by the mythical queen of the south sea). Along the way from Tugu to Keraton we can find Jalan Malioboro (Malioboro street) which has so many batik vendors offering cheap batik. We can also visit Vredeburg fort (just across the Dutch-style Post Office building) for a little history about Indonesia’s struggle for independence. However I didn’t manage to visit Keraton due to time constraint. You can go around Jogja pretty easily using Trans Jogja buses which are similar to Trans Jakarta, only smaller. One trip only cost you Rp 3000 (no matter how far you travel, as long as you don’t leave the shelter). Going from the airport to the city center and anywhere else is also easy, thanks to the integration of the airport with a train station and a Trans Jogja shelter. 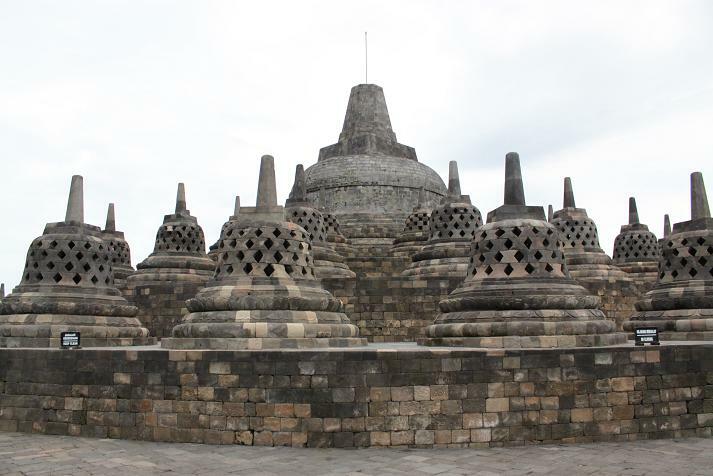 No visit to Jogja would be complete without going to the majestic Borobudur temple. This UNESCO World Heritage Site is in fact the largest Buddhist shrine in the world. 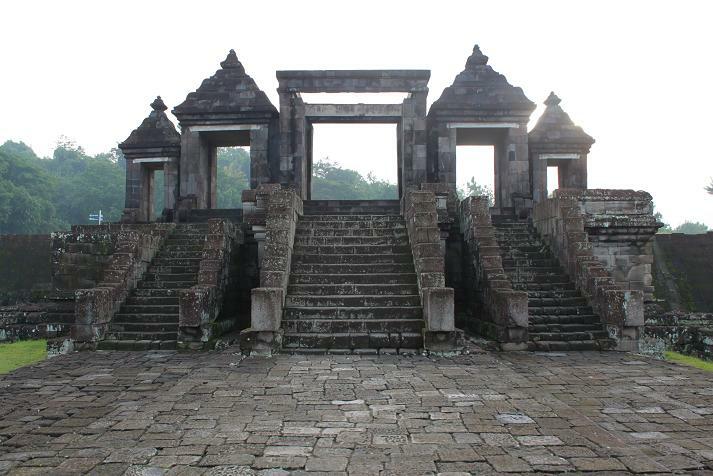 It was built on a hill about 42 km northwest of the city of Jogja. The temple is still used by Buddhists today especially during Waisak (Vesak) day. The temple can be divided into three parts. The first and second part are abundantly adorned by reliefs depicting Buddha’s journey, while the third part (the uppermost part) has may stupas containing Buddha’s statues. The largest stupa sits on the uppermost center of the entire temple, dwarfing the other stupas. Unfortunately, after Mount Merapi eruption, the third part of the temple is closed for tourists until full restoration work is completed. So, we can only see (not climb) the uppermost level. 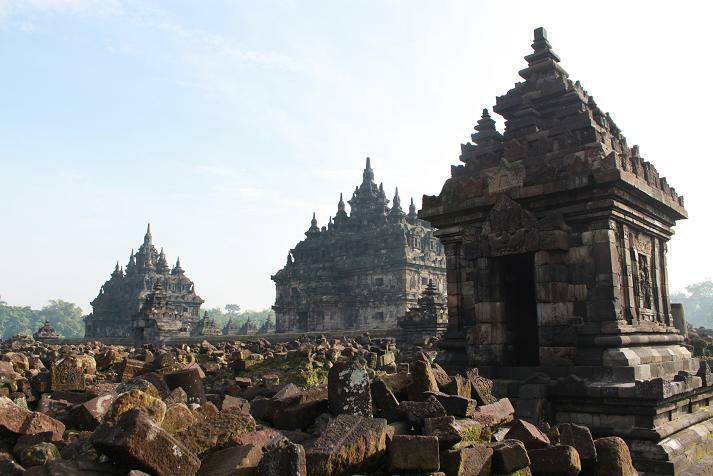 The Prambanan plain, which lies about 17 km from Jogja, is the place where most of ancient Hindu temples (some are also UNESCO World Heritage Sites) are located. The most beautiful and the largest one is the temple of Shiva which is sandwiched between nearby Brahma and Vishnu temples. 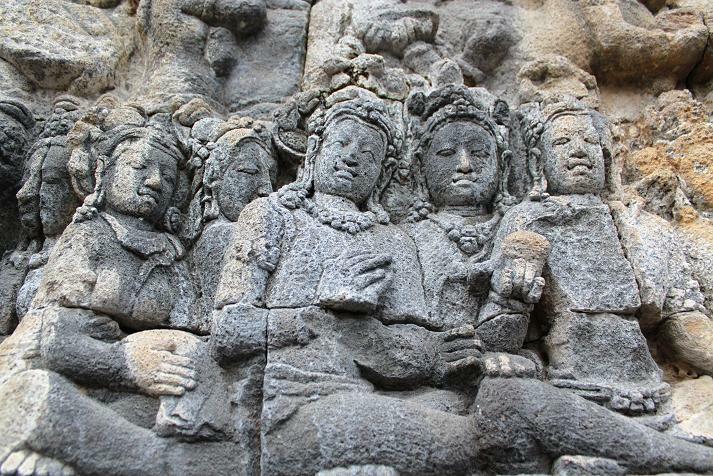 Although it is a Hindu temple, the depiction of the Hindu gods sometimes put some elements of Buddhism, for example: one relief shows Vishnu sitting on a lotus (lotus is widely used in Buddhism culture). Across each of the three temples sit the temples of the carrier of the respective god, for example: in front of Brahma temple sits Angsa (swan) temple (swan is the carrier of Brahma). 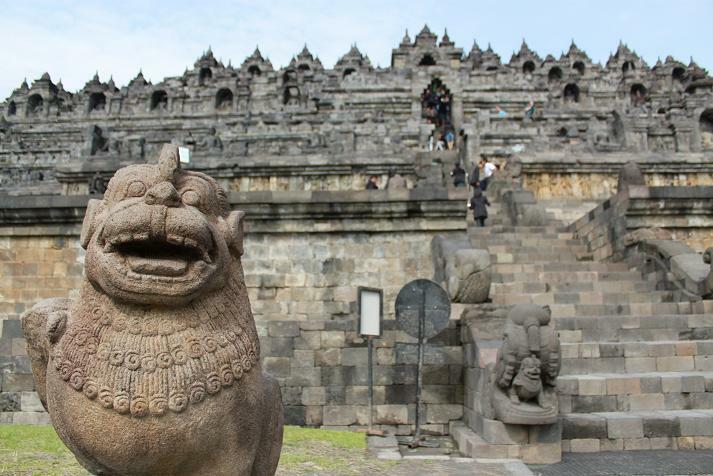 Walking 1 km north of Shiva temple we can find Sewu (thousand) temples. This Buddhist complex of temples used to be adorned with so many small temples, hence the name. 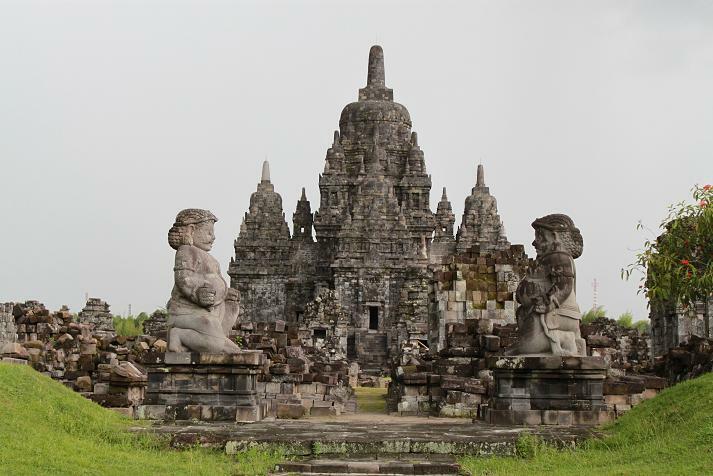 One interesting fact is that Sewu (Buddhist) is very close to Prambanan (Hindu). It pretty much describes religious tolerance at that time since both compounds were built in roughly the same era. For more pictures of Sewu you can go here. Kraton Ratu Boko is not actually a temple. 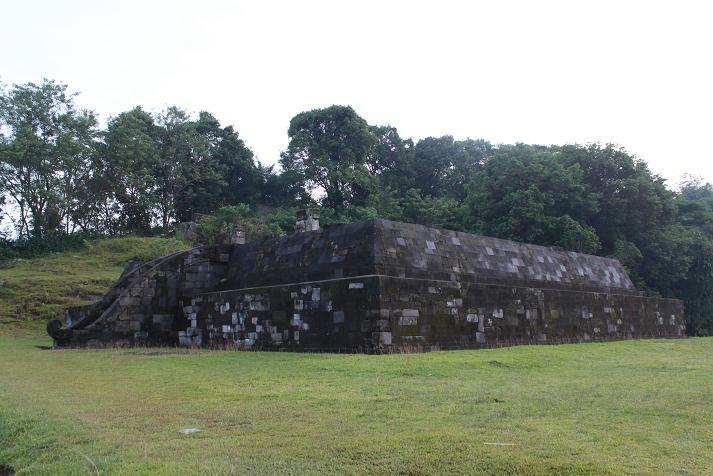 During the rule of Old Mataram kingdom it served as the royal palace. However only a little of the original compound has been restored. The most notable and intact part of Kraton Ratu Boko is its gate, which has just a few ornaments. We can also see the old wall which fortified this compound from its surroundings. Not far from the gate we can see the crematorium temple (after its original function as a crematorium). Nevertheless, scientific research never find any human trace in its well. So, presumably at that time people only burned wood inside the well on the crematorium temple. Overall Kraton Ratu Boko doesn’t have much to offer in term of its structure. In fact the reason for most people to come here is because it has a spectacular view of Jogja, Prambanan and other temples with Mount Merapi as the background. Very few people have ever heard about Plaosan compound of temples which actually deserves more attention due to its beauty. 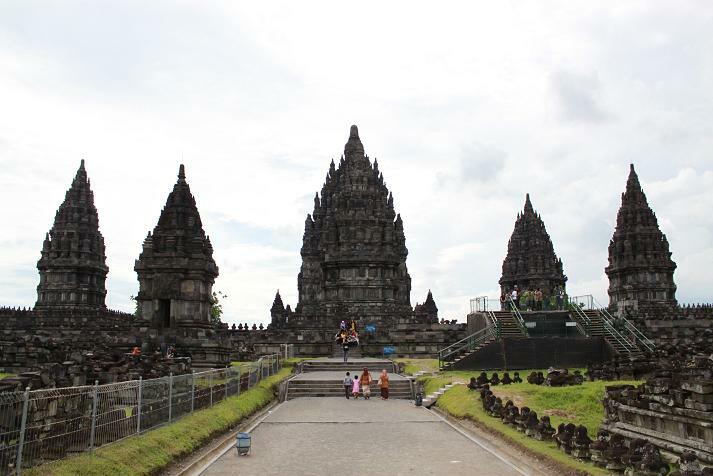 Its proximity with Prambanan temples (2 km) makes it quite easy to reach. When I went there I felt a different ambiance since my friend and I were the only visitors. It felt very silent and serene, also it gave me the excitement since I could explore the whole site without the annoyance of some teenagers shouting to their friends, among other things. 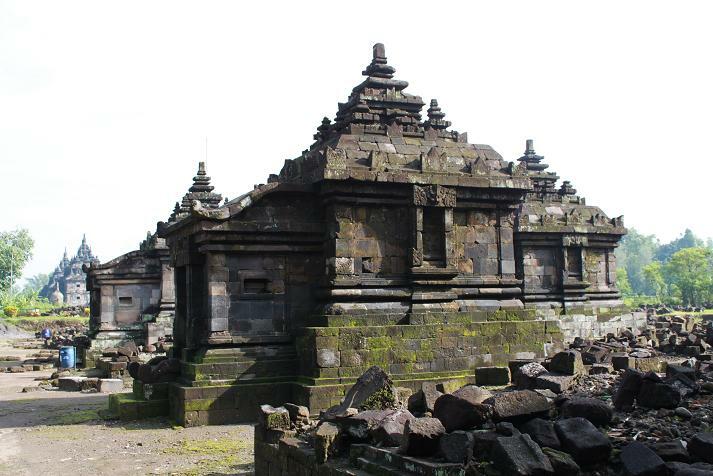 Plaosan compound of temples is divided into two parts, Plaosan Lor (North) and Plaosan Kidul (South) which are separated about 100 meters from each other. The northern compound consists of two identical temples with some smaller temples around the main temples. One thing that instantly got my attention was the existence of a stupa which is typical in Buddhist temples. 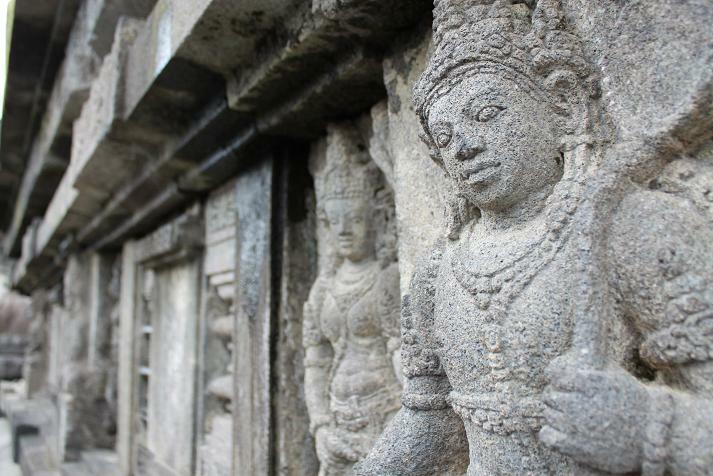 The walls of the temples are also adorned with many Avalokitesvara reliefs, another distinguishable mark of Buddhism. 100 meters south of the northern compound lies the southern Plaosan temples compound which consists of smaller temples. There is no entry fee to Plaosan complex, however the security officer would ask you for a voluntary donation. Actually there are still plenty of temples that can be explored, but again, due to time constraint I have to keep them for my next visit to Jogja in the future. Well, that’s all I can summarize from my last trip to Jogja. Come and visit those amazing temples which have been mentioned in this post and feel the ambience yourself. Seeing is believing. Bye for now. bam,kraton ratu boko tuh dmnnya jogja ya?sepertinya menarik!! 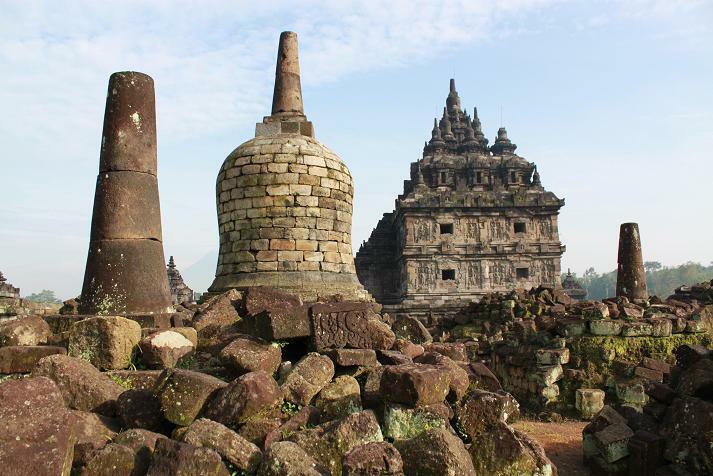 Went to Plaosan and ratu boko when I was small ……… Those stones scatter around the candi are one big puzzle game for archeologists. How long it will take them to figure out how they look like? I can’t tell for sure how long it took the archeologists to reconstruct all those ruins. But from what I saw, some ruins remain unreconstructed, probably because the archeologists can’t figure out for sure how those ruins looked like when they were still intact. Dude, How much did you pay for chorus hotel? Gue waktu ke yogya, gw nemu di lonely planet tuh hotel kita nginep, harganya Rp.350.000 (incld breakfast) and we got swimming pool too and just minutes to Malioboro. Kamar2nya modelnya kayak pendopo gitu, nothing fancy but clean and got AC. The staff are helpful too. Gue lupa namanya, tapi kalo ada yg interesting, email gue aja – nanti gue liat di buku gue lagi deh. Dan kalo mau naek gunung Merbabu ato Merapi (I guess not now :)bisa ngebook tournya di hotel desk and it cost about Rp. 90.000 Bargain! Kamar standar di Puri Chorus Rp 250.000 (single large bed). Kalo nginep lebih dari 2 hari bisa minta free anter ke bandara. Di depannya ada restoran yg jual bebek lumayan enak menurut gw. Kalo soal ngebook gw ga tau apakah mereka bisa bantu atau enggak. Oiya, Puri Chorus itu boutique hotel, jadi fasilitas kamarnya setara hotel berbintang tapi mereka ga punya kolam renang. You can fly from Manila to Jakarta by Cebu Pacific Air and from Jakarta you can take Air Asia to Jogjakarta (Yogyakarta)…It is worth visiting! Well, other than the 6-part posts about India which are coming soon around September, what will you write? Wow, reading your blog like reading wikipedia 🙂 Hehehe.. Very informative! Hahahaha, that’s a bit exaggerating I guess…but thanks Bin! Udah pernah ke Pangandaran dan gak berencana ke sana lagi sih. Tapi ke Green Canyon bagus sih katanya (dan liat foto temen2 juga sih). Tapi saat ini belum ada rencana ke sana..
sedikit ralat juga mbak (eh, semoga ga salah), klo borobudur emg terletak di magelang, pengelolanya juga dinas pariwisata jawa tengah. tapi kalo prambanan, lokasi fisiknya terbagi 2, jogja dan klaten. candinya di jogja, taman parkirnya di klaten. tapi otoritas pengelolanya dinas pariwisata yogyakarta. Sooo I’m proud to say I’ve finished reading nearly all of your blog posts in the category Indonesia ending at the one about my city, Yogya.. 🙂 It’s the most comprehensive English blog about Indonesia that I know, makes me wanna finally start travelling more around here and it’s an inspiration for me to write too. Good job, keep it up, Bama! Wow! I’m both impressed and grateful that you thoroughly enjoyed reading my posts on Indonesia. Apart from having the ‘privilege’ to live in Jakarta where ancient temples and pristine beaches are mostly just a short flight away, I felt the urge to write more about Indonesia as some believe, including me, that it is the most ‘invisible’ big country in the world — although it’s getting more and more popular in recent years. Glad my blog inspired you to travel more, Emi! Really appreciate your time reading my posts.